Happy Valentine’s Day! Hope you’re spending it with people you love doing things you love. 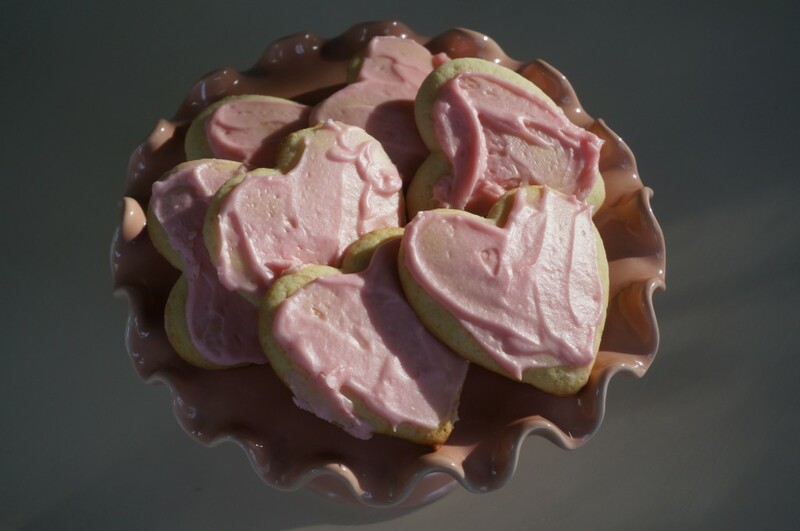 MJ has a teaching commitment tonight so I made Valentine cookies for him to share with his students and we frosted them together after enjoying a pre-Valentine’s dinner out. Note that I spread the frosting to the edges. He tried to leave a neat little border of unfrosted cookie. Probably tells you something about each of us. But even more telling is that we both frosted the cookies in our own preferred way and didn’t care a bit if the other frosted their cookies differently. That’s a good thing about having been married for thirty-seven years. We can see each others’ differences and (mostly) not let them totally bug us! If you’re busy frosting cookies or doing something else that is amenable to podcast listening you might enjoy Krista Tippett’s interview with philosopher and writer Alain de Botton about love and relationships. This is on the heels of him having written the most downloaded essay in the New York Time’s last year about Why You Will Marry The Wrong Person. Grateful I ended up with the person who’s wrong for me in all the right ways. This entry was posted in Spirit, Style and tagged Alan de Botton, cookies, differences, Krista Tippett's, Valentine's Day. Bookmark the permalink. Post a comment or leave a trackback: Trackback URL. Sweet and lovely, both the cookies and the post;).